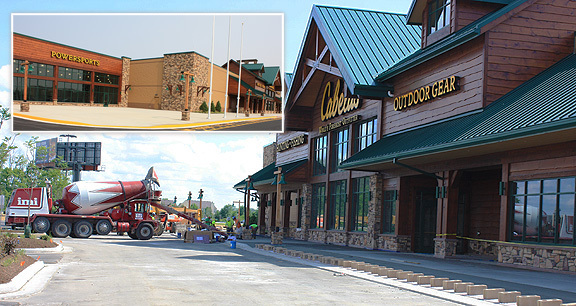 Project obstacles and solutions: In March 2014, Cabela's announced it was building a new retail store in Noblesville, Indiana. Pepper Construction was hired as the general contractor for this 80,000 square foot facility. Hagerman Construction poured all of the concrete footings, piers, floors and walkways around the immediate building. Sidewalks in the parking lot, islands and curbs were built by E&B Paving. R.L. McCoy used a 130' conveyor to move concrete from truck to pour site for all of the interior concrete. One of the key features of this building was the polished concrete as a finished floor. This was alternated with carpet laid on top of the concrete. The concrete mix for the floor was designed to produce a fine paste. The grinding process to polish the floor was dependent upon good consolidation of the coarse aggregates and a fine paste on the surface. IMI QC/QA designed a mix that would accommodate this specification. The concrete slab also had to eliminate excess water in the slab for the adhesion of the carpet. The mix included a superplasticizer to reduce water-to-cement ratios and keep bleed water to a minimum. IMI supplied 3,000 yards of concrete for this project. Cabela's will open the new store in the fall of 2015.